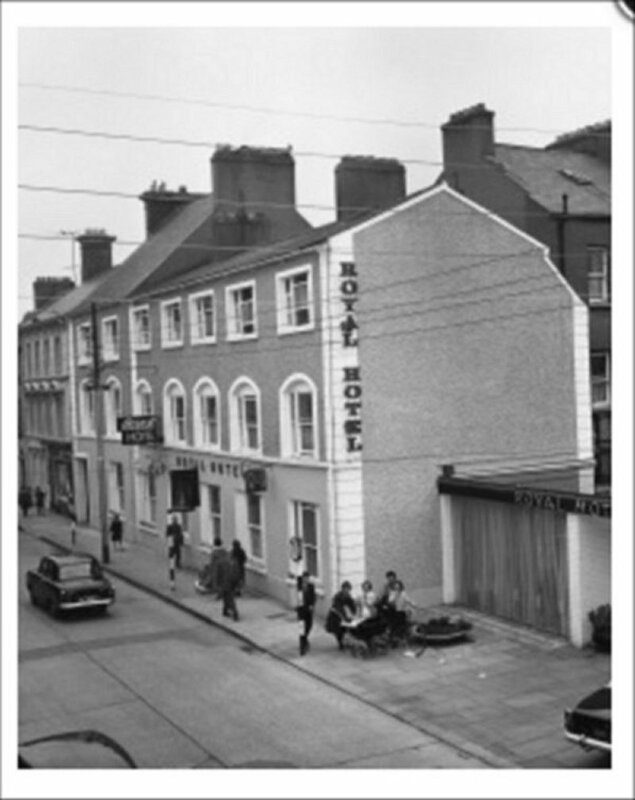 The Royal Hotel in Dublin Street c1950's. 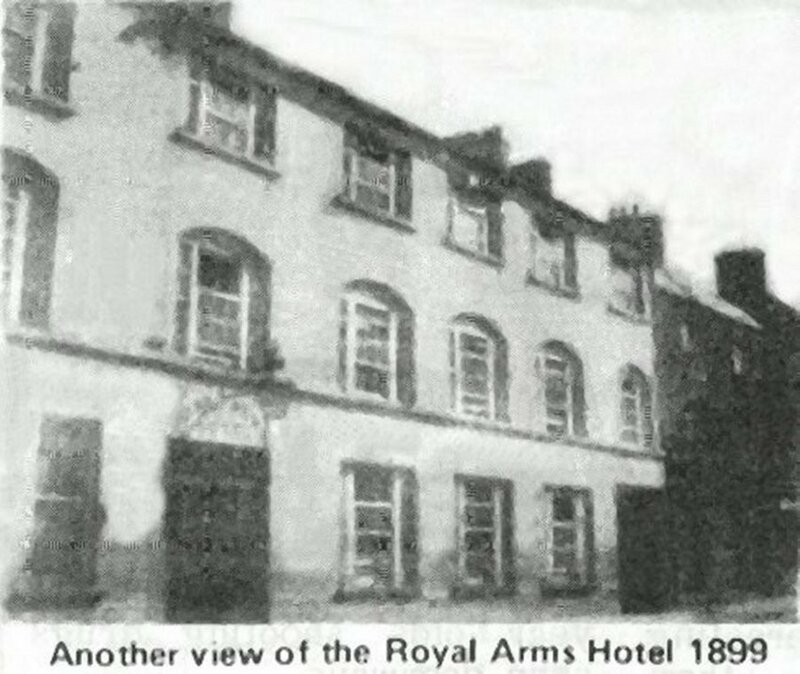 This hotel which was established around 1765 has gone through many name changes during its long history namely The King's Arms Hotel, The Royal Arms Hotel. 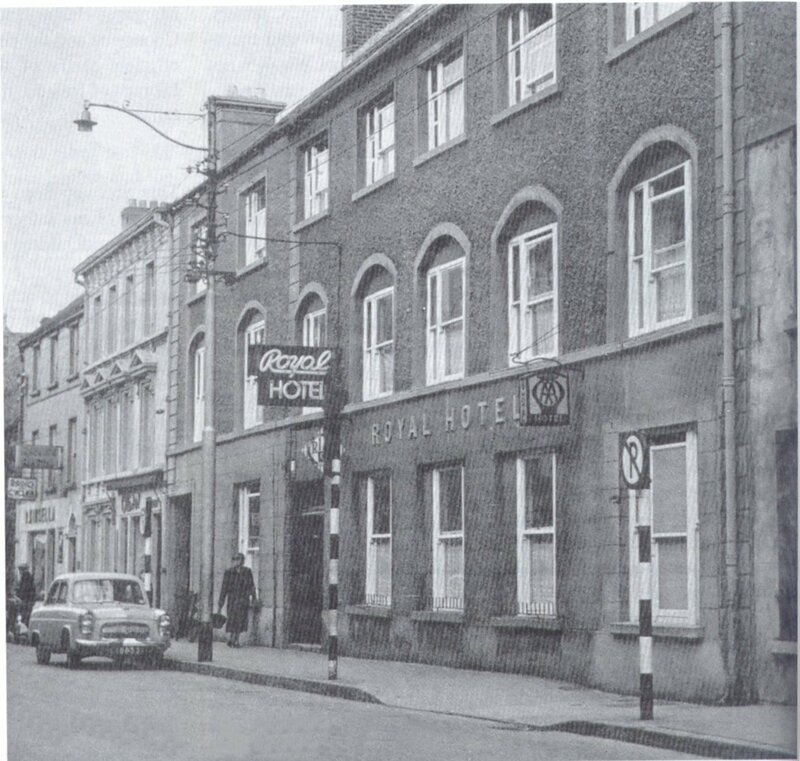 It was also know as The Queens Arms Hotel, and Cullen's Hotel, and before it was raised to the ground in 2002 it was known as The Royal Hotel. This hotel has been in existence for almost 237 years, and whereas at one time the hotel comprised only number 12 Dublin Street, it eventually extended to numbers 10 - 13 Dublin Street. 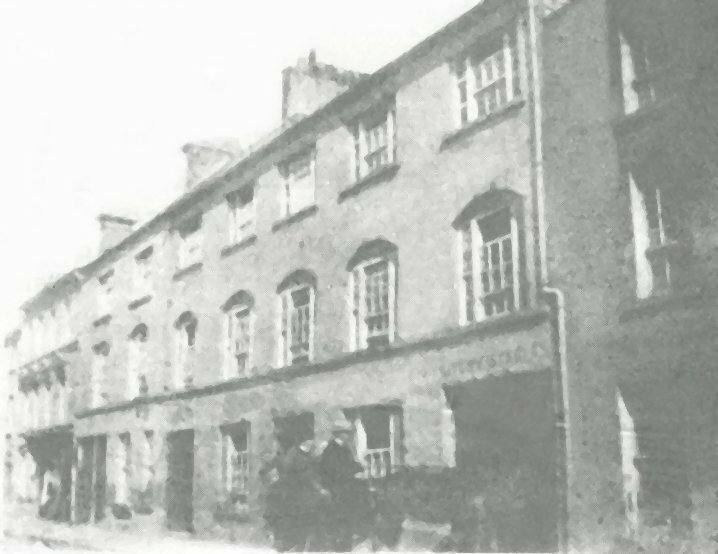 James Cullen was the proprietor of this hotel in the mid. nineteenth century. 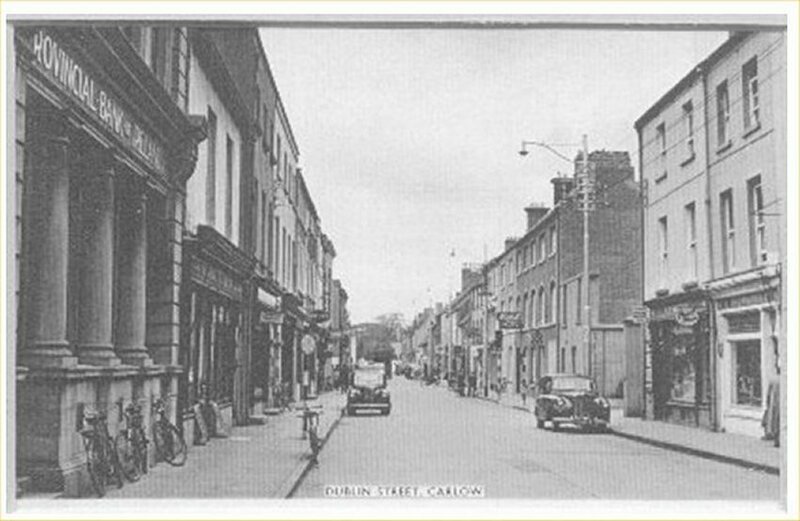 In the 1950's the hotel was owned by the Duggan family, also of Dublin Street, and they added a ballroom to the rear of the hotel plus a new side entrance was created which gave access for guests and visitors to and from the car park which could accommodate up to 55 parking spaces. 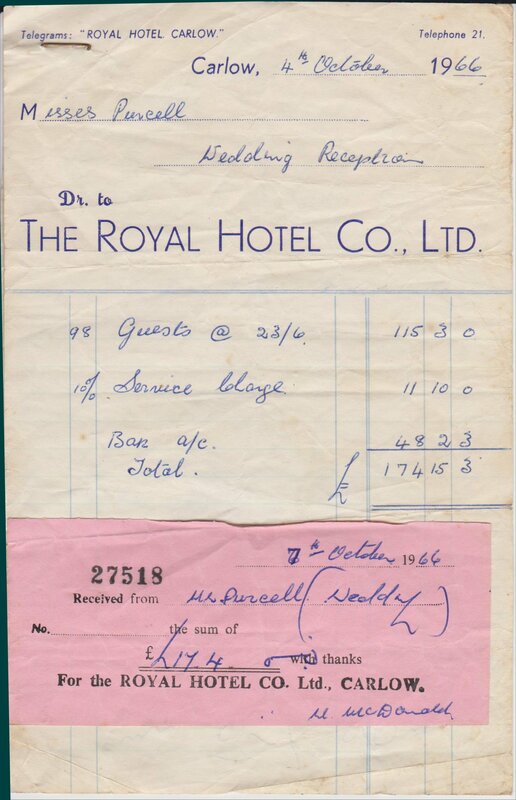 Miss Ryan was the manageress and the receptionest, Larry Moran was the Head Porter and I was his assistant. The hotel had a 2 Star rating and was AA recommended. In 1998 it comprised 34 en-suite bedrooms, 3 Conference / Functions rooms, several Meeting rooms, Lounge Bar, and a large Restaurant. In 1967 it would have cost you £2.10s a day for Bead & Breakfast. 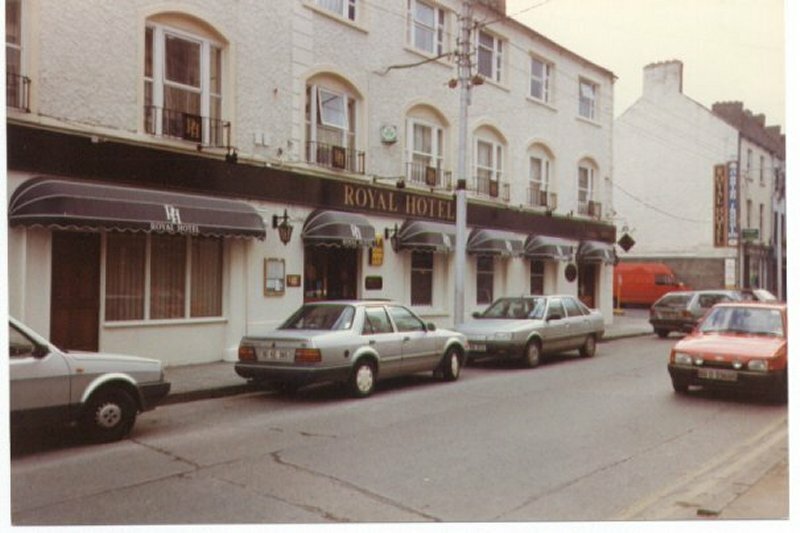 In 1998 the hotel was owned by John McDermott for the past ten years. The hotel was demolished in 2002. A sad end to an era in Carlow History. 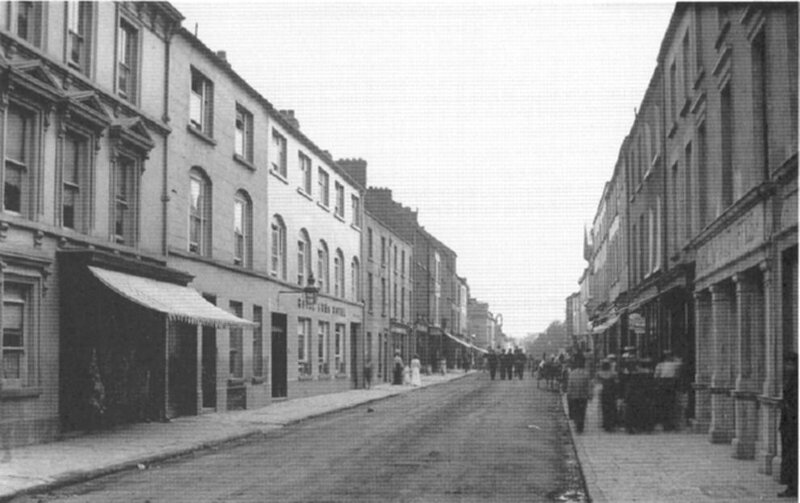 Dublin St & the Royal Hotel on the left in the late 1800's looking South. Also notice a group of RIC men in the middle of the street. Dublin St & the Royal Hotel in the late 1899 looking North. Dublin Street in the 1950's looking North with the Provincial Bank on the left and the Royal Hotel on the right just past the large lamp post. 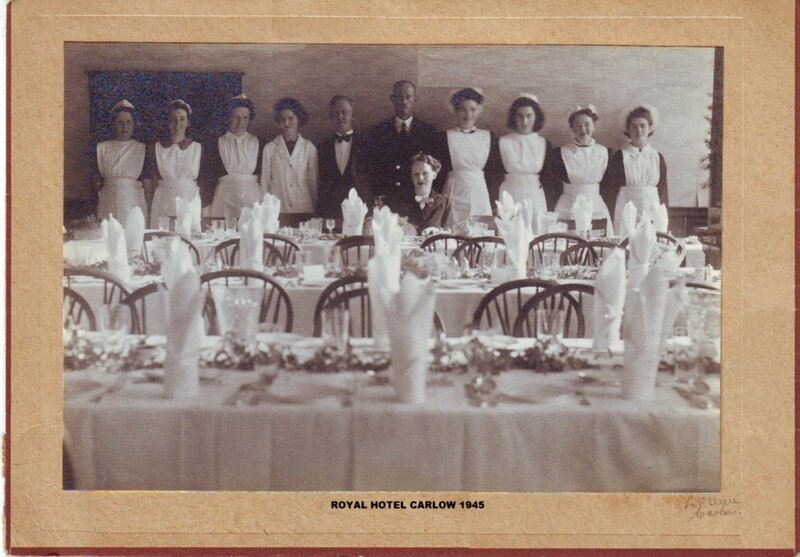 Staff of the Royal Hotel in the restaurant in 1945. 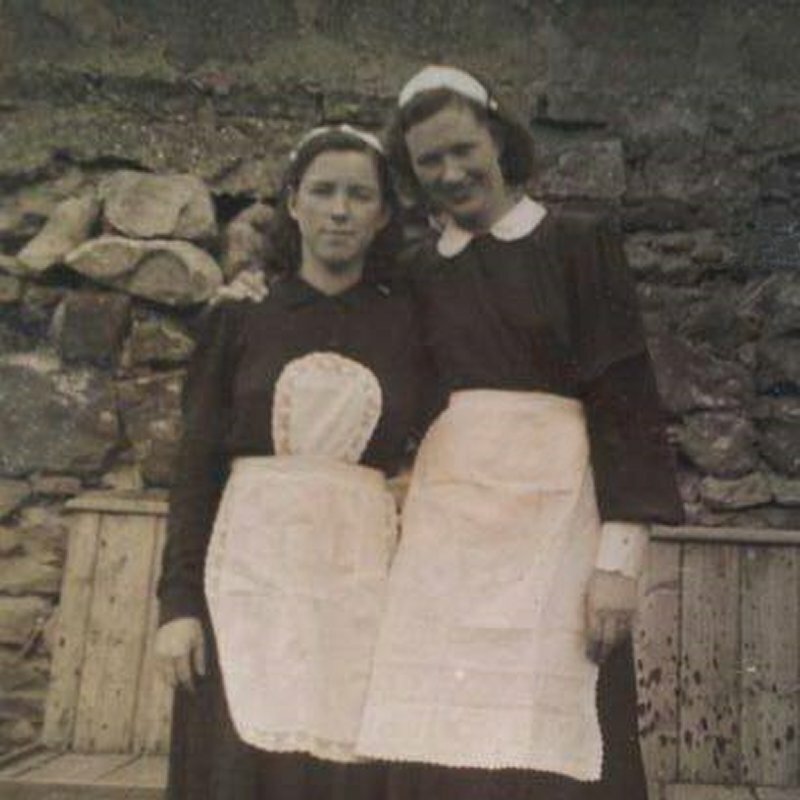 MRS. CULLEN returns her most grateful thanks to her numerous friends and the public for the support given so liberally to her hotel since its erection, a period of nearly Forty Years: and takes this opportunity of soliciting a continuance of their patronage. The above-named hotel being situated in the centre of the town and contiguous to the Church, Cathedral, Courthouse, Banks, &c., &c., will be found most convenient for Traders, Agents, Merchants and all other travellers. The strictest attention shall be paid to the comfort of those who may favour her establishment, which has recently undergone every necessary decoration in painting and papering. In connection with the Royal Arms Hotel is an extensive and commodiously arranged Bathhouse at which baths can be had at the shortest notice and on the most reasonable terms. Parties stopping at the old established Royal Arms Hotel will be sure to meet with those attentions which are so essential to their comforts. The charges will be found to be moderate. N.B.—A well appointed car waits the arrival of different trains, to convey persons to the Hotel.